Patrick Adams, Engineer - C. Simon, Composer, Author - William Griffin, Composer, Author - Eric Barrier, Composer, Author - JAMES BROWN, Composer, Author - Bobby Byrd, Composer, Author - Clarence Haskins, Composer, Author - Eric B. & Rakim, Producer, MainArtist - Charles Fred A. Bobbit, Composer, Author - Grady thomas, Composer, Author - Unichappell Music, Inc., MusicPublisher - Bridge Port Music Inc, MusicPublisher - Universal-Songs of PolyGram International Inc., MusicPublisher - Elai Tubo, Engineer - Michael Dewayne Williams, Composer, Author Copyright : ℗ 1987 UMG Recordings, Inc.
Patrick Adams, Engineer - William Griffin, Composer, Author - Eric Barrier, Composer, Author - Eric B. & Rakim, Producer, MainArtist - Universal-Songs Of Polygram International Publishing Inc., MusicPublisher - Elai Tubo, Engineer Copyright : ℗ 1987 UMG Recordings, Inc.
William Griffin, Composer, Author - Eric Barrier, Composer, Author - Eric B. & Rakim, Producer, MainArtist - Universal-Songs Of Polygram International Publishing Inc., MusicPublisher - Raine Shine, Mixer Copyright : ℗ 1987 UMG Recordings, Inc.
C. Simon, Composer, Author - William Griffin, Composer, Author - Eric Barrier, Composer, Author - JAMES BROWN, Composer, Author - Richie Rich, Mixer - Bobby Byrd, Composer, Author - Clarence Haskins, Composer, Author - Eric B. & Rakim, Producer, MainArtist - Charles Fred A. Bobbit, Composer, Author - Grady thomas, Composer, Author - Unichappell Music, Inc., MusicPublisher - Bridge Port Music Inc, MusicPublisher - Universal-Songs of PolyGram International Inc., MusicPublisher - Michael Dewayne Williams, Composer, Author - P.J. "Dyna-mix" Smith, Mix Engineer Copyright : ℗ 1987 UMG Recordings, Inc.
William Griffin, Composer, Author - Eric Barrier, Composer, Author - Eric B. & Rakim, Producer, MainArtist - Universal-Songs Of Polygram International Publishing Inc., MusicPublisher - The Wild Bunch, Re-Mixer Copyright : ℗ 1987 UMG Recordings, Inc.
William Griffin, Composer, Author - Eric Barrier, Composer, Author - Eric B. & Rakim, Producer, MainArtist - Derek Boland, Re-Mixer - Universal-Songs Of Polygram International Publishing Inc., MusicPublisher Copyright : ℗ 1987 UMG Recordings, Inc.
William Griffin, Composer, Author - Eric Barrier, Composer, Author - Eric B. & Rakim, Producer, MainArtist - Universal-Songs Of Polygram International Publishing Inc., MusicPublisher - Chad Jay, Re-Mixer Copyright : ℗ 1987 UMG Recordings, Inc.
William Griffin, Composer, Author - Eric Barrier, Composer, Author - Eric B. 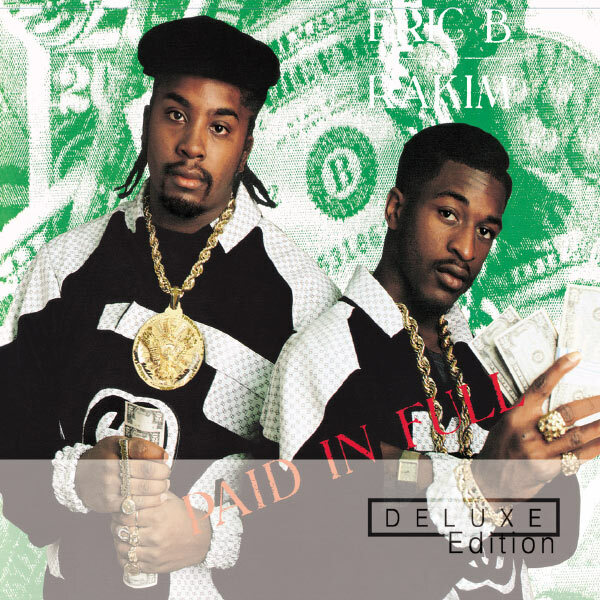 & Rakim, Producer, MainArtist - D.J. Slack, FeaturedArtist - Universal-Songs Of Polygram International Publishing Inc., MusicPublisher - The Democratic 3, Mixer Copyright : ℗ 1987 UMG Recordings, Inc.
Patrick Adams, Re-Mixer - Marley Marl, Re-Mixer - William Griffin, Composer, Author - Eric Barrier, Composer, Author - M.C. Shan, Re-Mixer - Eric B. & Rakim, Producer, MainArtist - Universal-Songs Of Polygram International Publishing Inc., MusicPublisher - P.J. "Dyna-mix" Smith, Remix Engineer Copyright : ℗ 2003 UMG Recordings, Inc.
C. Simon, Composer, Author - William Griffin, Composer, Author - Eric Barrier, Composer, Author - JAMES BROWN, Composer, Author - Bobby Byrd, Composer, Author - Clarence Haskins, Composer, Author - Eric B. & Rakim, Producer, MainArtist - Charles Fred A. Bobbit, Composer, Author - Robert Hill, Executive Producer - Grady thomas, Composer, Author - Unichappell Music, Inc., MusicPublisher - Bridge Port Music Inc, MusicPublisher - Universal-Songs of PolyGram International Inc., MusicPublisher - Michael Dewayne Williams, Composer, Author Copyright : ℗ 1987 UMG Recordings, Inc.
William Griffin, Composer, Author - Eric Barrier, Composer, Author - Eric B. & Rakim, Producer, MainArtist - Robert Hill, Executive Producer - Universal-Songs Of Polygram International Publishing Inc., MusicPublisher Copyright : ℗ 1986 UMG Recordings, Inc.